If you haven't purchased the groundbreaking supplies yet for your upcoming building construction, then you’re at the right place. 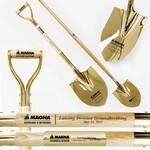 We have a variety of ground breaking ceremony supplies. Groundbreaking ceremonies are usually attended by important politicians and business men. So having fancy shovels and scissors to commemorate the event, and showcase your new construction is important. The piece will be saved and displayed in the new building once complete. Put your name on the shovel or scissors along with commemorative information. 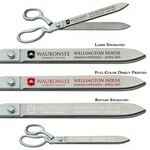 Whether you need the big personalized scissors for the ribbon cutting ceremony, or the shovel engraved with your company logo. Promotion Pros is your one stop shop for all of your giveaway and personalized items. Whether it's your grand opening, re-opening, or simply a special event, our 15" Chrome Ceremonial Scissors will fit the occasion. Place your logo on these oversized scissors for your next ceremony! Whether it's your grand opening, re-opening, or simply a special event, our 15" Gold Ceremonial Scissors will fit the occasion. 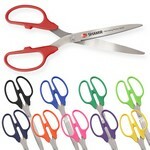 Place your logo on these oversized scissors for your next ceremony! Whether it's your grand opening, re-opening, or simply a special event, our 25" Ceremonial Scissors Gold Blade will fit the occasion. 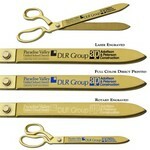 Place your logo on these oversized scissors for your next ceremony! Whether it's your grand opening, re-opening, or simply a special event, our 25" Ceremonial Scissors Silver Blade will fit the occasion. Place your logo on these oversized scissors for your next ceremony! Whether it's your grand opening, re-opening, or simply a special event, our 36" Ceremonial Scissors Gold Blade will fit the occasion. Place your logo on these oversized scissors for your next ceremony! Whether it's your grand opening, re-opening, or simply a special event, our 36" Ceremonial Scissors Silver Blade will fit the occasion. 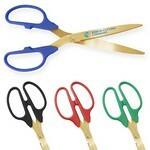 Place your logo on these oversized scissors for your next ceremony! 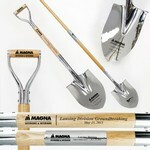 Our fully customizable Traditional Chrome Ceremonial Shovel is great for marking the groundbreaking of a new project. Place your logo on the shovel blade, shaft, and a handle! Our fully customizable Traditional Chrome Ceremonial Shovel with Spade Engraved is great for marking the groundbreaking of a new project. Place your logo on the shovel blade, shaft, and a handle! Our fully customizable Traditional Gold Ceremonial Shovel is great for marking the groundbreaking of a new project. Place your logo on the shovel blade, shaft, and a handle! Our fully customizable Traditional Gold Ceremonial Shovel with Spade Engraved is great for marking the groundbreaking of a new project. Place your logo on the shovel blade, shaft, and a handle!